Opticell Ag+ wound dressing uses a unique gelling Chytoform TM technology that allows the absorbent fibers of the dressing to transform into a clear and conformable gel. The unique gelling action helps manage drainage and remove dead, damaged and infected tissue from the wound, trapping it for later removal at the dressing change. ChytoformTM technology wicks fluid only vertically, not laterally, helping to prevent maceration. 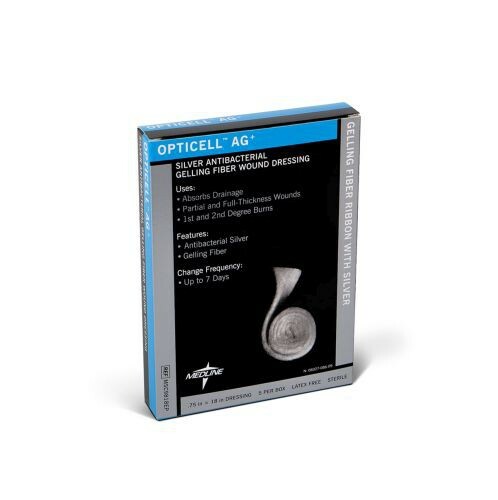 Opticell Ag+ has a conformable and thin profile that provides optimal contact with the wound. Although Opticell is designed specifically for moderate to heavily draining wounds, it can also be pre-moistened for effective use on dry or lightly draining wounds. 1. In-vitro antibacterial data on file.